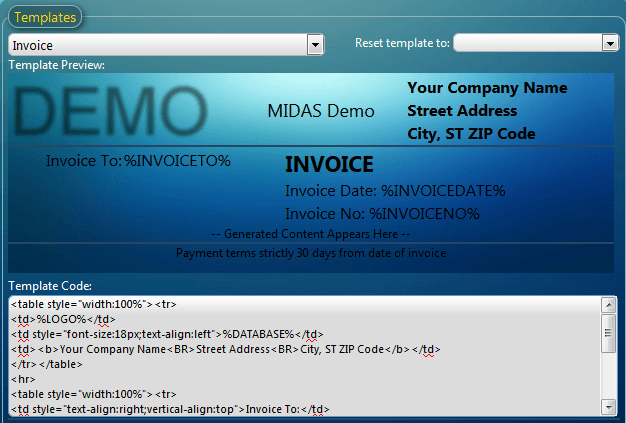 MIDAS contains a number of editable templates that may be customized in order to control the appearance and content of outgoing emails, printouts, invoices, and more to suite your particular organization. Templates may be viewed and modified by a user with sufficient privileges via MIDAS Admin Options → Manage MIDAS → Templates. The "Template Code" area allows direct input of HTML and inline CSS code. The "Template Preview" area renders a preview of the current Template Code, but this preview itself may also be modified directly by inserting/editing text or moving elements around, etc. Given the popularity of HTML and CSS, there are a wealth of resources and tutorials available online should you wish to learn more about this simple mark-up language, but if you're brand new to HTML/CSS and find it a little daunting, we'll describe below some common HTML codes and inline styling which you'll find useful when it comes to customizing your templates within MIDAS. 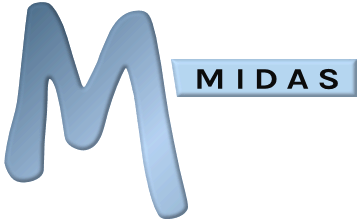 The above are examples of basic HTML code and inline styling which will help you get started with customizing the various templates available within MIDAS. To learn more about HTML and CSS, please search for "HTML tutorials" and "CSS tutorials" in your favorite internet search engine. Please note that invalid code within your MIDAS templates may cause them to display incorrectly, or not at all. But don't worry, if you get into a mess you can reset individual templates to their system default at any time via the "Reset Template" drop-down above the template editor. Why are variables not being substituted in my templates? How do I insert a page break into my invoice template?